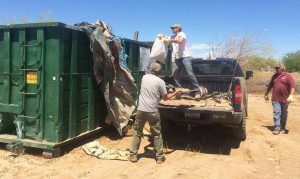 About 50 local hunters and members of Arizona Outdoor Sports, Inc., came out on April 29 to remove garbage and clean up a popular dove hunting area near Mesa. The group filled two dumpsters in just three hours of work. Arizona Game and Fish works in partnership with many organizations on cleanup and habitat improvement projects. Many thanks to the dedicated volunteers who came out and exhibited their good stewardship of Arizona’s outdoors. Remember, respected access helps maintain open access. Arizona Outdoor Sports is an all-volunteer nonprofit organization that helps engage youth and novices with shooting sports, hunting, conservation, and the great outdoors. For more photos from the event, visit https://spark.adobe.com/page/Pmt2sFYu3ppZZ.